At a special groundbreaking ceremony today The Henry Ford announced the plans for a new playscape located inside Greenfield Village. Made possible through a generous gift from Don and Mary Kosch, this one-of-a-kind historically themed playground will be a place where children of varying physical, developmental and sensory abilities can play and learn together within the same environment. Encompassing approximately 25,000 square feet, the playscape will be located adjacent to the carousel and near restrooms and food facilities making it convenient for families. This historically-themed playscape is designed to resemble a 1920s construction site. 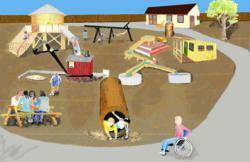 At the center of the playscape is an interactive steam shovel where children can play with the levers inside or dig in the sand located at the bottom of the steam shovel’s bucket. The fenced-in site will also include a rock climbing wall, a water tower, swings, an interactive boiler feature, a cement mixer and two actual artifacts – a boardable 1931 Ford Model AA truck and a 20-foot-long boiler tunnel that originally sat near the Armington and Sims Machine Shop inside Greenfield Village. With the support of a planning grant from the W.K. Kellogg Foundation, The Henry Ford was able to ensure that the design of the playscape met or exceeded all accepted accessibility standards. The site will include multi-level topography with ramp accessibility, bonded and concrete rubber surfaces that are ADA accessible and elements constructed out of natural or authentic materials keeping with the overall aesthetic of Greenfield Village. The playground will undergo construction throughout the year with the goal of opening for guests’ enjoyment during the fall of 2013.